Over the years, Sarah and I have relied on Cascade Complete to get our dishes clean. We’d tried a lot of different dishwashing detergents, particularly when we were first living in apartments where a dishwasher was available, and we just found that Cascade Complete got our dishes cleaner. We didn’t have to re-run loads. We didn’t have to pre-wash dishes. We didn’t have to worry about overloading. 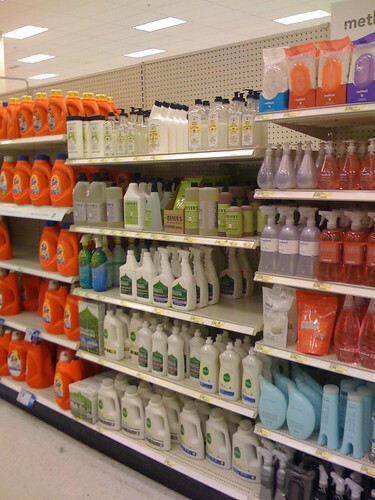 It just got the job done consistently – something we couldn’t say about other dishwashing detergents. Because of this, we just adopted a routine of buying Cascade Complete whenever we needed dishwashing detergent. We’d recognize the logo on the store shelf, find the best bargain on it we could, stack a coupon on top of that (usually), and head to the checkout. Some time in 2010 – I think it may have been in the spring – I noticed that our dishes weren’t getting very clean. They looked sort of dingy and they often would still have caked-on food or smudges on the glasses (with little kids, smudged glasses are a very common phenomenon). After doing a bit of studying, I learned that Cascade Complete had removed the phosphates from their dishwashing detergent, making it much less effective and putting it almost exactly on par with other phosphate-free dishwashing detergents that cost substantially less to buy. Simply put, we haven’t used Cascade Complete in a year and a half. We either use a generic brand or a homemade mix. The brand on the bottle means little, after all – it’s what’s inside that washes your dishes. Companies work very hard to associate brands with certain things in our minds. Apple. Nike. Sony. Olive Garden. Each of those things – and countless others – causes us to picture certain things in our minds and often causes us to have certain assumptions about the products that carry those brand names on them. For us, Cascade Complete was synonymous with “clean dishes,” but that eventually proved not to be the case. Not because they changed the brand, but because they changed what was inside the box. The label on the outside of the box doesn’t mean you’re going to always get the same thing inside the box. What does that mean for us? Don’t become attached to brands. The particular item that is on top of the heap right now might not necessarily be on top of the heap next year if a particular item changes its contents or a competitor produces a better product. The product you once started buying because it was the best bang for the buck quite likely isn’t the best bang for the buck any more. I can easily recall a similar experience with a Sony Walkman during my childhood. When I was about eight, I had a secondhand one that was industrial strength. I used it for about six years until it was dropped into a lake. I wouldn’t be surprised if someone were to dive into that lake and find a fully-functioning Sony Walkman. I bought a replacement, expecting a similar durable product. It worked for about three months, then it started eating and shredding tapes. I attempted to turn it in under the warranty and just wound up battling Sony’s customer service until it wasn’t worth it any more. The Sony name and the Walkman name meant very little. The product inside is what mattered. My solution to all of this is to just completely abandon any meaning when it comes to brand names. All they’re useful for is making it easy to identify a certain item on the store shelf. What I do instead is constantly watch for product reviews. I read publications like Consumer Reports and The Consumerist pretty faithfully and I simply watch for what their comparative studies suggest is the current best “bang for the buck.” I stick with that for a while until an updated comparison comes out. When I’m about to buy a more expensive product, I research it thoroughly, but the brand name doesn’t mean a whole lot. If it’s an electronic item, for instance, it’s likely that it was made out of many of the same components in the same Chinese factory no matter what name is on the box. If it’s a dishwashing detergent, the vast majority of the materials in the box are exactly the same. The small differences between the items have little to do with the name on the outside of the box. All I care about are features and price. Those things matter far more than the name on the package. I’m striving to apply the same philosophy to everything I see. Does it matter what car someone else bought? Not really. They just decided that it had the right set of features for them. I might not value those same features, but then again, I’m not the person spending the money. If I see someone driving a Jaguar, for example, all I can really conclude is that they have a different set of features that they care about in a car than I do. I’m not defined by the brands that I buy, nor is anyone else. They’re just stickers on the outside of an item that will ideally make my life a bit easier or more enjoyable. Nothing more, nothing less.